The 2019 Ford Taurus is designed to be a sleek and head-turning full-sized sedan. When you want to drive in style, Bob Thomas Ford West can show you your various options for this unique vehicle. 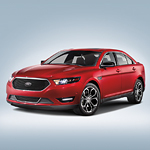 The Ford Taurus comes with several wheel options. You can get anything from an 18-inch Sparkle Silver aluminum wheel set to a 20-inch polished aluminum option. You can take pride in your vehicle as you drive around Fort Wayne. The in the rear, the dual chrome exhaust tips will add to the sculpted look of the entire vehicle. The LED taillamps are brighter than traditional headlamps and also use less energy. To help you see in front of you in the dark, the Ford Taurus comes with HID headlamps. They will turn on automatically when they sense it getting dark or when you turn on your windshield wipers. Their curves flow with the shape of the car.